With the Scott heads-up display, firefighters can now breathe easier. The new display features the integration of LEDtronics' LEDs into the respiratory protection features on Scott Health and Safety’s groundbreaking Air-Pak NxG2 Self-Contained Breathing Apparatus (SCBA). Miniature LEDs illuminate the Air-Pak’s Buddy System Indicators that enable firefighters to keep tabs on each other while in hazardous environments, and the Heads-Up-Display that shows the air level of the SCBA to the firefighter. Scott designed its HUD to mount onto their E-Z Flo II Regulator. The regulator then attaches to the face-mask, positioning the gauge in the firefighter’s field of view. 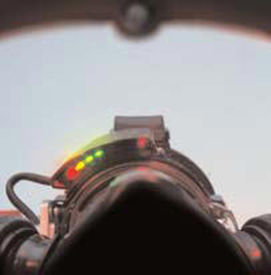 To light up the Heads-Up-Display, Scott engineers selected LEDtronics' LEDs due to reliability and brilliance. Need a price on Reconditioned Scott HUD Visual SCBA Display's?